Michelle Obama in Jason Wu. 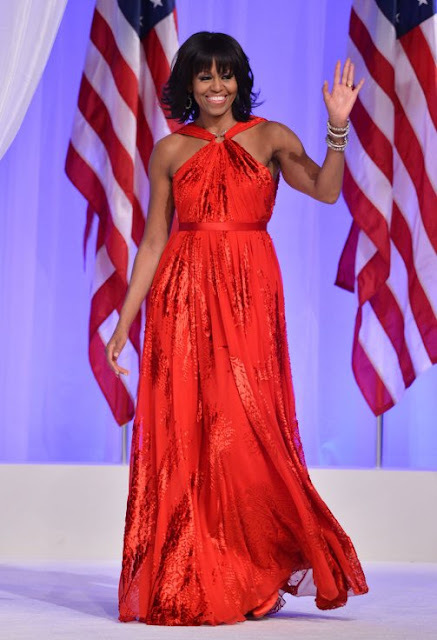 Michelle Obama looked beautiful in a gown by Jason Wu at the Inauguration Ball last night. Some were surprised that she chose a gown by the same designer she did at the 2008 Inauguration including the designer himself. He told Women's Wear Daily that he was surprised to learn she wore another one of his designs. 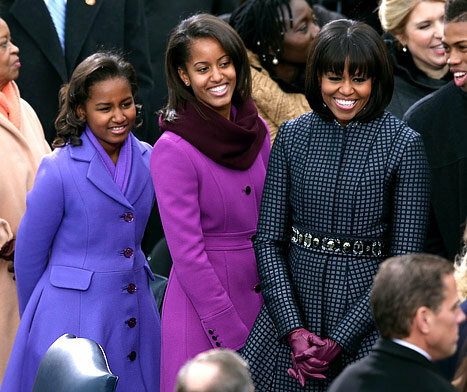 During the day Mrs. Obama elected to wear an ensemble by Thom Brown which she later accented with a belt by J.Crew. Her daughters, who are growing up so quickly, looked well put together also. Malia wore everything J.Crew while Sasha wore a dress and coat by Kate Spade.